It has taken a long time to reach this point, so here’s a summary of the entire puzzle so far. The 7 mini-puzzles represented by the 7 Solids are each a step towards the final solution. Solving each mini-puzzle reveals instructions for finding 75 objects located in squares around the border of each page and placing them in sequence. The line of solids at the top right of P4 and the sliding block puzzle at the top left of P18 are the two key clues. They tell you to perform the steps in order and to jump around between different “levels” of the book, ie to jump between different pages. First is the Pyramid puzzle. This tells you to draw lines through the book starting from 12 special “Zodiac” squares placed around the border. The first Zodiac square is S0, the butterfly/Aries square at the 1 o’clock position. Each square in the sequence is a further four squares clockwise round the border. The number of starting points on each page is indicated by the number of black-and-red witch hats. The Cone puzzle tells you that the lines that started at a Zodiac point pass through a golden alchemy symbol. The puzzle establishes an order for the 12 alchemy symbols based on the number of diamonds on the wings of 12 spitfires scattered through the book. But it does not tell you how to find the correct alchemy symbols. The Cube puzzle tells you that you need to turn to a different page of the book to find the correct golden alchemy symbols. Counting up silver and gold sublimate of sulfur, or Merlin symbols, tells you to turn pages left or right in the book. On that new page are the alchemy symbols that are the mid-point of the lines started in the Zodiac squares. Extending these lines to the border gives a border square that marks the end-point of each line. The Sphere puzzle tells you to count up the silver and gold cadency symbols. 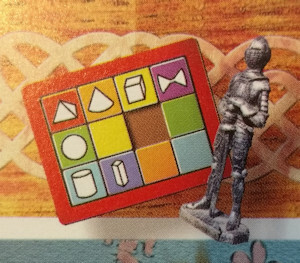 This solid is marked on the second row down in the sliding block puzzle telling you that you count the symbols on the second level, ie on the page you turned to to find the correct alchemy symbols. Each cadency symbol has a value between 1 and 9 and adding up the gold and silver symbols gives you a number of pages to turn left or right in the book to reach a third level. The Cylinder puzzle tells you to count up the crescent moons. Since the Cylinder is in the third level of the sliding block puzzle, this is done on the third level page. These moons tell you to move round the border clockwise or anti-clockwise from the border square that was the end-point of the Zodiac-Alchemy line. 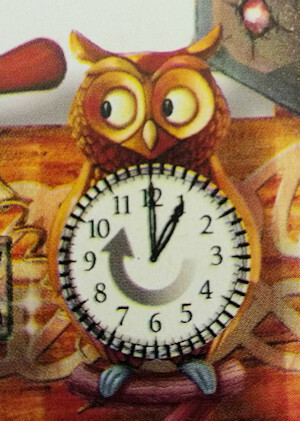 The owls’ eyes and the clocks tell you which moon points in which direction. The object in the final border square reached is a solution object. The Cuboid puzzle tells you to place the solution objects in a special order. It assigns one of the Roman numeral digits I, V, X or L to each Alchemy and Zodiac symbol. The copper tiles that run anti-clockwise round the border then spell out a number between 1 and 75. This number is assigned to the solution objects found on that page based on the order that they appear going clockwise round the border from S0, ie from 1 o’clock. The Diabolo puzzle tells you to turn to the next page of the book. The Diabolo is in the first level of the sliding block puzzle, so you return to the first level page before carrying out this instruction. The above sequence is carried out for each page in the book and produces an ordered list of 75 solution objects. Drawing 75 lines through the book to find the 75 solution objects is a monumental task. Give it a go if you want. The PDF crib sheet will prove very useful. The next part of this solution will list all the solution objects in order. Then begins the task of interpreting the results.